The 7th Grade Division produced a new champion and had some fresh names that played great. Here’s our look into the top performers from the Class of 2019. Germir Robinson Guard (Rens)- This was Robinson's Spotlight debut with the Rens and his play reminded us of how he looked during the Super Skillcase in Atlantic City. The combo guard dominated with power and his scoring ability. I really like how he uses his left hand to finish at times and stays in attack mode. All weekend he played with passion which helped them capture the banner. Philip Joseph Forward (Rens)- Some might regard Joseph has a physical enforcer but I did see some skills in the young forward. He was light on his feet and had decent touch on his turnaround in the lane. On defense he rebounds with a purpose and attempts to alter or block shots in his area. His play gives his team a attitude and burst of energy. Judah McIntyre Guard (Rens)- It’s a joy to watch the pint size floor general bark orders to his larger teammates but he seems to get his point across. McIntyre once again set the tempo and got everyone involved. He’s definitely an important clog to this squad while serving as an extension of the coach on the floor. Jose Figueroa Forward (Rens)- The new pickup is a wide space eater inside that understands that his role is to score close to the cup. His mass helped him get deep position and box out opposing rebounders. He has had good enough touch to get things done scoring wise in the paint. Brian Hall Guard (Rens)- One of the best potential prospects in this group Hall seems to get longer each time he enters a Spotlight event. Right now his main weapon is his 3 point bombs. He knocked down 5 of them in their victory over Maryland Playmakers. Jay Heath Guard (Team Takeover)- Heath has good size for a two guard and the game to match. Heat was able to slash to the lane for buckets or hurt you from deep with the trey ball. Just ask Team Final as he killed them with 20 points in their quarterfinal victory. Josh Watts Guard (Team Takeover)- Speaking of slashers you could add Watts to this category. He also has good size for the position and is a capable finisher. He gets out on the break quickly and understands that his job is to get the ball in the bucket. Carsten Kogelnik Forward (Team Takeover)- Kogelnik let things go early in the finals by knocking down two deep treys. He has good form on his stroke and had a big smile on his face when the coach gave him the green light. 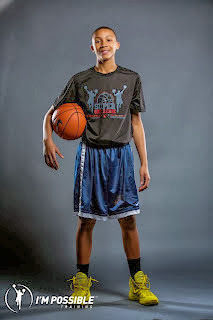 Anthony Harris Guard (Team Takeover)- Harris played double duty while also performing on the 8th Grade level. His best game came in their semifinal showdown versus 6th Man Warriors. The athletic combo guard stormed his way to 16 markers and pushed Takeover into the finals.